ROBBERY. - Patrick Blood and Jno. Madden, (two decent looking men) were charged with stealing 9 oz. 13 dwts. of gold from a Chinaman named Kin Tock. Mr Donne appeared for the prosecution, and Mr Trench for the defence. 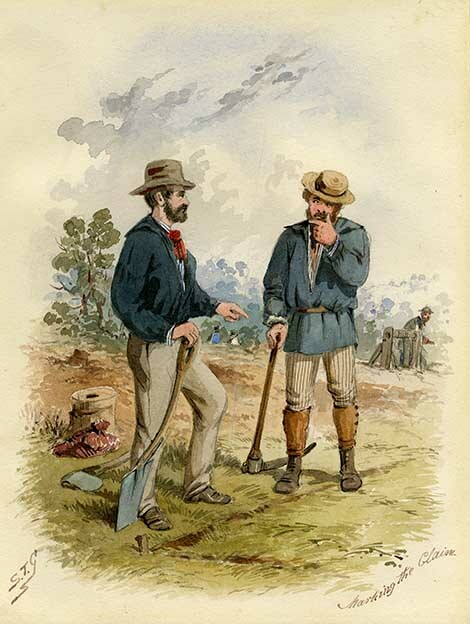 The case for the prosecution was the following:—the prisoner's and the prosecutor's parties, formed two parties of miners on the Eureka, within a quarter of a mile from each other. On Saturday last, at ten a.m., the prisoners and three others were together, when Blood harnessed the party's horse to the Chinaman's cart. Prosecutor objected to this proceed-ing, and two other Chinamen named Yan Tuch and King Young, ran for an interpreter to get the police. The prisoners ran after them, caught all three, and forthwith locked them in a stable. A crowd collected round, and some time afterwards the prisoners came into the stable, held the prosecutor by head and legs, while a boy cut open the latter's belt and took the gold from him. The Chinamen were then turned out of the stable, after which they walked away. This evidence was in effect given by the three Chinamen concerned, who were subjected to a lengthy cross-examination by Mr Trench. They however adhered to the letter of their statement. Detective Hyland then proved the arrest of the prisoners, who were pointed out by the Chinamen among a crowd of Europeans. He had known the prisoners for a length of time as hard working men. Mr Trench then commenced the case for the defence, which he stated would consist of an alibi. Patrick and Thomas Callinan successively stated that Blood was nowhere near the spot in question at the time of the offence : that he had not been at the claim for three weeks, and another man was working in his place. As for Madden he had gone into the shaft at half past nine, before the row commenced, and not come out of it till after eleven, when he and Patrick Callinan released the prisoners from their durance vile in the stable and turned them out. On cross-examination the witnesses seemed to be somewhat confused about the minor details of the affair, respecting which they were closely questioned. The examination by Mr Trench, Mr Dunne, and both the Magistrates on the Bench, lasted an uncommon length of time, and it was more than half past four p.m, when Mr Trench called Patrick Dwyer, who deposed to having witnessed the row and to the absence of the prisoners from it. Mr Trench announced that he had several other witnesses to call but the Bench said that though an assault had doubtless been committed, the Chinamen were most probably mistaken about the robbery and identity of the prisoners. After the character given of them, it appeared impossible they could commit the robbery. Prisoners were discharged. ↑ Ballarat Star, 13 May 1859. This page was last edited on 6 August 2017, at 11:04.